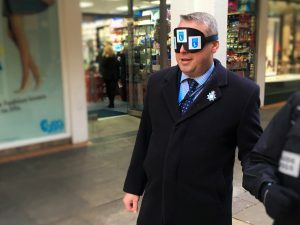 POLICE Commissioner, Jason Ablewhite joined members of the public who are blind or partially sighted in Cambridge City on Friday 8th December to help raise awareness of the challenges they face when visiting Cambridge City. 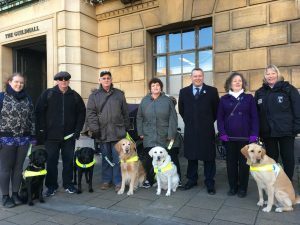 Jason, wearing a blind fold, was joined on the walk outside the Guild Hall, Market Square, by Helen Sismore, Guide Dogs Community Engagement (Officer) for East Anglia and members of the public with their guide dogs. Almost two million people in the UK live with sight loss that has a significant impact on their daily lives. Of those, around 180,000 rarely leave their homes alone and lead lonely, isolated lives. The charity, Guide Dogs UK provides support to help people with sight loss move around safely and confidently, to get out of their homes and be able to live their lives the way they choose. “By taking part in this walk, I wanted to raise awareness about the challenges people with visual impairment face on a daily basis. I spoke to members of the Cambridge Guide Dog Forum in August and one of the things they told me is that their dogs are often attacked and/or intimidated by unleashed dogs belonging to people in the city centre. They also find people parking so that they block pavements which means they have to walk out on to the road, putting their lives and that of their dogs at risk. “These issues can make local residents feel vulnerable and often stops them wanting to go in to Cambridge, reducing their quality of life. Helen Sismore added: “Every hour, someone in the UK starts to lose their sight. With 43% of people who lose their sight suffering from depression and more than 70% lacking the confidence to join in everyday activities, these issues need to be addressed. A clip of what the hazards of vehicles parked on pavements is available here: https://youtu.be/K2CZZUCxu9c.